by Bayer HealthCare Philippines, Inc.
Used in the treatment of fungal infections such as white spots (An-an), ringworm (Buni), Athlete's foot (Alipunga), jock itch (Hadhad) and other skin fungal infections. Apply a thin layer on the affected area 2-3 times daily for 2-4 weeks to eliminate symptoms, thoroughly kill the fungus, and restore the healthy state of your skin or as prescribed by the doctor. For external application only. Avoid contact with eyes. Caution use in pregnancy and in children below 2 years old. Rarely, skin reactions or local irritation. 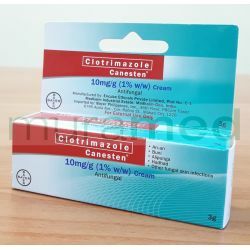 This product should not be used in patients with known hypersensitivity or allergy to clotrimazole, other antifungal agents, or to any of its components.